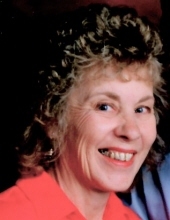 Janet Arlene Key was born August 23, 1941 in Salinas, California and passed away April 8, 2019 in Bryan, Texas. She was the daughter of Edmun & Wilma (Dockstader) Buttle. Janet grew up in California near Lemon Grove. She married her husband, Everett Oran Key, when she was only sixteen years old. Janet lived most of her life in Midway, Texas. She enjoyed sewing, crocheting, quilting and especially talking and visiting with others. Janet also loved traveling to Colorado to visit her son, Erick. Janet was preceded in death by both of her parents; husband, Everett Oran Key; infant son, William Foster Key; son, Everett Alan Key; one sister and one brother. She is survived by son, Erick Brent Key (Stephaine) of Cypress; brother, Dennis Ingram of San Diego, CA and grandchildren, Ericka Lynn Key, Kayla Rae Lynn Key and Noah Austin Key. Funeral services for Janet will be held 2 P.M., Sunday, April 14, 2019 at Madisonville Funeral Home in Madisonville, Texas. The service will be officiated by Brad Brock and interment will follow in Midway Cemetery in Midway, Texas. The Key family will receive friends Saturday, April 13th from 6 P.M. to 8 P.M. at the funeral home. To send flowers or a remembrance gift to the family of Janet Arlene Key, please visit our Tribute Store. "Email Address" would like to share the life celebration of Janet Arlene Key. Click on the "link" to go to share a favorite memory or leave a condolence message for the family.